If you are considering a career in law enforcement but do not want to become a police officer, you might think about becoming a parole officer. These professionals deal with offenders who have been released from prison to serve out the remainder of their sentences. There are numerous responsibilities entailed in the job, and people who work in this profession must be able to overcome their own prejudices and attitudes. When offenders have good records while incarcerated, they may be given the opportunity to complete their sentences in the community. They may live in private residences or half-way houses, secure employment, attend school and otherwise lead normal lives, but they must do this within the parameters of the conditions of their release. The parole officer monitors the offender to ensure he is doing this, and also assists him or her with transitioning back into society. Unlike probation officers, who deal with offenders who are offered probation instead of a sentence, these officers work with people who have served a portion of their sentences and are being released, under supervision, back into the community. The primary duty of this professional is monitoring the offender. To do that, it is necessary to meet with him or her on a regular basis. During these meetings, the officer assesses how well the offender is re-integrating and how well he or she is complying with court-imposed restrictions. If the officer feels the offender needs further restrictions such as travel limits or restricted contact with other persons, he may impose those conditions as well. 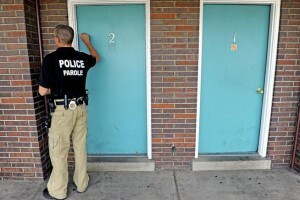 A parole officer may arrest an offender for non-compliance and the person could be returned to the prison to complete the sentence in incarceration. A more positive aspect of the job is the opportunity to help offenders access resources such as counseling and education to make their transition back into society easier. The parole officer may have to administer drug and substance tests to monitor an offender’s use of alcohol and drugs. He or she may also be charged with overseeing the use of ankle monitors to control the movement of offenders during certain times, which means the officer is on-call 24/7. The officer has the right to perform searches of an offender’s residence if he suspects the person is in non-compliance. He also can make an arrest, usually accompanied by a police officer. All states require that people in this position be at least 21 years of age. You also must have a clean arrest record. Beyond that, you will need at least a bachelor’s degree in criminal justice or a related field. Courses you might take include correctional administration, victimology, ethics, criminal and abnormal psychology and others, according to the Houston Chronicle. States generally require certification, which is maintained by taking continuing education courses. During the 1990s mandatory sentence guidelines were introduced that reduced the number of officer’s needed in this profession. Since then, prison over-crowding, stemming in part from the War on Drugs, and budget restrictions have caused courts to recommend parole more often. The projected job growth rate, at least through 2020 is about 18 percent, which is average. The median salary is $47,200, but this varies by geographical location. Helping offenders to once again become productive citizens is a positive aspect of this position. Still, law enforcement requires a non-judgmental “toughness” when dealing with offenders. A parole officer is a vital component of our legal system and a good career choice for the right person.